BREAKING NEWS! As We Approach the 100th Anniversary of Fatima, Has the 3rd Secret Secret Finally Been Revealed?? June 2013 It has been revealed that Cardinal Alfredo Ottaviani who read the 3rd Secret of Fatima on May 13th, 1960, eventually gave the secret to Father Luigi Villa. Father Villa in turn, before he died, reveals the encrypted secret and pleads to have it revealed to the world. Pray, Pray, and Prepare as the BVM requested at LaSalette, Fatima and Akita! HISTORY. Could this be a re-visit from the Destroyer of the Old Testament days? 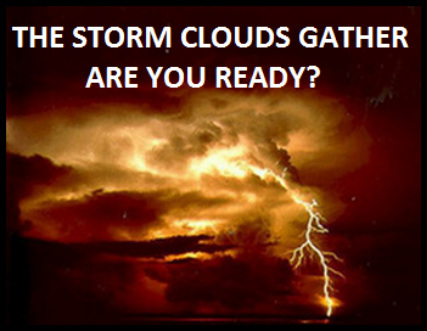 Our nation is on the brink of the biggest collapse the world has ever witnessed. What you do in the next few months will determine if your family can endure. Every day that things still work is a gift from God--enjoy it to the fullest and take the time to prepare. AND AS PREDICTED A FAMINE Will Come! NO POWER =NO WATER. TAKE STEPS NOW WHILE YOU STILL CAN! Do you have a well? Are you worried about loss of power for an extended period of time? After all, some things are negotiable but not water. Is your well too deep for a hand pump? Water solution #1 Simple Pump. It installs as a hand pump next to your submersible pump, even at water depths up to 350 ft. and can easily be pumped right into your home inline plumbing. It has solar and motor capabilities. Perfect for off-grid living. Water Solution #2 No well, No tap water? 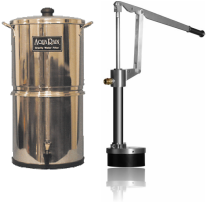 The AquaRain Water Filter It doesn't matter where you get your water-the tap, a rain barrel, a well, pond, creek, virtually any source. The AquaRain guarantees pure, clean, safe drinking water free from odor, discoloration, e-coli, Giardia, Cryptosperidium or any pathogens. Keep your family safe now and in an emergency.